The combination of meat with fruit, not many people take with enthusiasm, however in some cases it can please everyone. For example, when it comes to soft, literally melting on the tongue pieces of the kebab. To make aromatic meat dish turned out exactly like this, to add to the marinade, puree, juice or pulp kiwi. Peel kiwi and cut into quarters. Rinse the mint, spread on a paper towel and let dry. Tear off green leaves and lay them in the bowl of a blender or food processor along with the prepared fruit. Blend everything until smooth. Remove the husks from onions and garlic cloves and chop: first – thick rings, the second slices. Prepare the meat, put it in a large container, sprinkle with spices and salt to taste. Keep in mind that ready-made seasonings already contain salt. Add in a bowl the vegetables and green sauce. Mix everything together with your hands, working carefully so as not to break the bow. Set on top of the cargo and marinate the skewers with kiwi half an hour. The fruit contains much acid, so they very quickly soften the meat and with a long exposure begin to eat away at him. 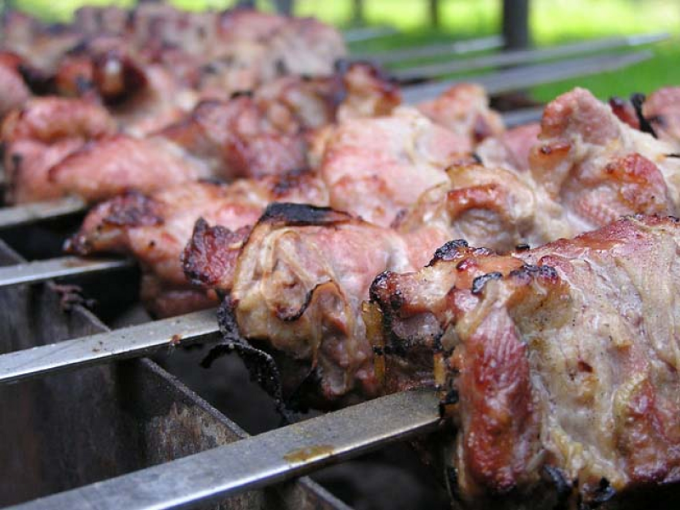 In any case, not peredergivaete skewers in the marinade, otherwise it will turn to mush. - 1.5 tbsp of salt. Slice the onion into half rings, put in a deep bowl or container and mash with your hands or a masher for mashed potatoes. Put pieces of meat about the same size. Season with coriander, salt and pepper. Squeeze the juice of kiwi, pour raw kebabs and leave it to soak spices and fruit marinade, but for not more than 1 hour. Liberally sprinkle the red hot coals with salt. Then drained while cooking, the fat will not cause flashes of fire, and you will not desiccate the meat. Use to marinate meat chemical-resistant crockery made of ceramic, glass or enamel with no chips. Chop meat into cubes the size of 2 stacked with each other match box. Connect them in a pan with onion rings, kiwi, chopped into small cubes, and spices and salt. All carefully stir until components are evenly distributed, cover with mineral water, stir it again and let stand 1 hour.